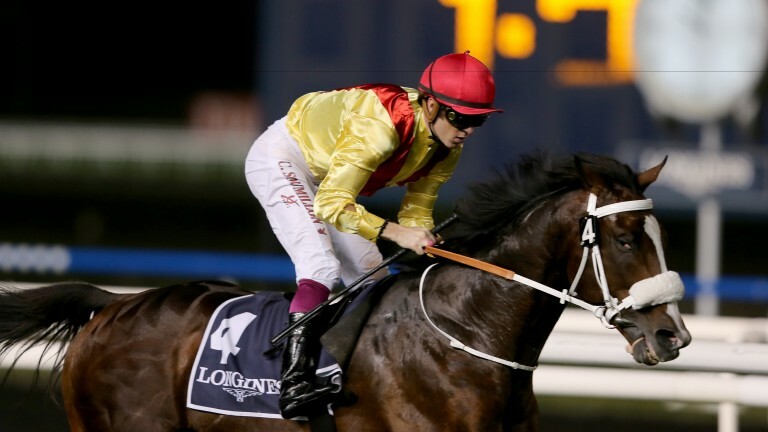 Mike de Kock has won the Group 2 Al Fahidi Fort six times and has two bites of the cherry at the highlight of Thursday’s carnival card at Meydan. De Kock's most recent win was in 2014 with Anaerobio, who is back for more along with the intriguing Noah From Goa, the choice of Christophe Soumillon. Noah From Goa, a new recruit to the trainer’s Dubai team, won the Grade 1 Cape Guineas at Kenilworth in South Africa in December 2015 but has not been seen on a racecourse for more than a year. De Kock said: "Noah From Goa is an exciting horse but did suffer a small setback in Newmarket so is perhaps slightly behind schedule. That said, he is going nicely and this looks the perfect spot to get him back out after a year off." Pat Cosgrave partners Anaerobio for the first time since his controversial ride on the horse in the 2014 Jebel Hatta, which ended with the jockey banned and fined. Thgat issue was resolved only recently, when Cosgrave paid nearly £45,000 to be able to ride again in the country. De Kock said: "Anaerobio has won at three carnivals for us and ran well enough on his return. He’s in good form and should, as always, give it his best shot." Godolphin boast the only last-time-out winner in the eight runner line-up in Flash Fire. Trainer Charlie Appleby said: "We gelded him after his last run in England and he seems almost a different horse. He was very impressive two weeks ago and hopefully can build on that over what we think is his optimum trip." Britain is also represented by the Brendan Powell-trained Dark Emerald, a dual carnival winner in 2015, and the David Simcock-trained Dragon Mall, who finished third at Chelmsford just before Christmas. Powell said: "We’re very happy with Dark Emerald and are hoping for a big run." Simcock said: "Dragon Mall would probably prefer an extra furlong but that looks to apply to two-thirds of the field. He had a good prep at Chelmsford, we're very happy with him, and he should be staying on in the straight." Earlier on the card, Godolphin have three of the 14 runners in the UAE 1,000 Guineas Trial. Appleby saddles Calare, a Listed winner at the Curragh on her most recent appearance who on official ratings has plenty in hand over her rivals. However, like most of them, she needs to prove herself on the Meydan dirt. Bin Suroor runs Really Special, also a Listed winner and unbeaten in two starts, and Voice Of Truth, who shed her maiden tag at the third time of asking on her most recent start at Chelmsford in October. Simcock saddles Island Vision, while Richard Fahey is also represented with Rajar.